Moving on both the sides and the Upper & Lower Fixed Base Platen are equipped with stainless steel plates for best results. 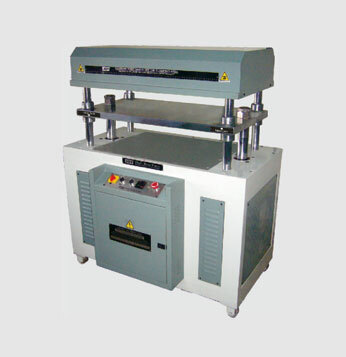 Centrally positioned Moving Platen is convenient for utilizing maximum idle time. While the lower deck is being used for pressing the stack of books etc, the upper deck can be loaded for next cycle. Timer can be set to meet specific requirement of boards / cards / sheets. The system would release the stack of book from either upper / lower deck after a pre-set time. Thereby ensuring all books are pressed uniformly . Control Panel is equipped with Mains Switch; Pump ON/OFF Switch; Switch for operating the system in Manual Mode; Timer (0-999 seconds) Manual / Auto Mode Switch and Emergency Switch. Castors are provided for maximum space utilisation.